There are many things up in the air on Search Party right now, but one thing’s for certain: This is all mostly Dory’s fault. The hunt for Chantal, Keith’s death, the gang’s inevitable discovery—they’re all links in a chain of events that the unmotivated twentysomething set in motion when she couldn’t take hanging drapes in a Park Avenue condo anymore. This reality makes Dory less sympathetic than when she was being rejected from a tutoring gig by a woman who clearly didn’t have it together in season one, which makes Alia Shawkat’s performance all the more vital. She has to stick to her obsessive quest for truth and meaning, which puts her on the path to committing that most cardinal of sins for female characters: being unlikable. I hesitate to call her an anti-hero, because although she does sort of fit one of the requirements—doing things most people only think about—she also has a conscience that she acts on, for the most part. But she’s also done some terrible things while acting on selfish whims, so she’s not exactly Leslie Knope either. Dory is—what’s the word?—complicated, a development that might please her if she were aware of it. She’s not, of course, even as she accepts an award for a fake rescue in “Paranoia.” Dory is all nerves and nausea, especially after learning about Drew and Chantal. Their reunion is naturally tense, with Drew preferring to ride in to Chappaqua with the Witherbottoms instead of sharing a ride with Dory, Por-tee-a, Elliott, and Marc (who is not under ANY circumstances allowed on stage). It’s also one of my favorite scenes of the season so far. There’s no real dialogue once the gabby Witherbottoms leave the green [pink] room, but the nearly wordless exchange speaks volumes about the great core cast. It’s like a Rube Goldberg machine of physical reactions that ends in Portia’s realization of what transpired between Chantal and Drew. Things kick off with Dory’s narrowing eyes, followed by Drew hanging his head, which leads to Elliott fairly stabbing the air with his fingers. And finally, when Portia gasps in shock, she’s also voicing Dory’s dismay, who just stands there with her mouth hanging open. If a little flag with the word “SHAME!” on it went up at the end of the scene, it wouldn’t really be out of place (okay, it would, but you know what I mean). This 30-second scene seemingly solidifies their bond, as they communicate so much while saying virtually nothing. But by the end of “Paranoia,” the group has been irrevocably shattered. We’re past the rift between Dory and Drew—not only has Keith’s body been found, but she’s had to admit to making a very dumb move while attempting to cover their tracks. Portia’s “DORY! NO!” seals the deal on just how bad an idea it was to email Deb from Keith’s laptop, days after he was killed. In the final moments, the four friends are all back at Drew’s (and formerly Dory’s) apartment; at first, they seem to compare notes on just how bad things are. Keith’s body has been found, Agnes is wondering if her aunt’s house is at all connected, and Drew just confessed to taking the murder weapon and burying it (but Agnes is being surprisingly cool about it with that $200 Venmo request). Almost everyone agrees that they’re all but exposed, but Dory lags behind them in awareness—she insists their cover-up is holding up. Drew thinks she’s just trying to keep the “adventures” going, but I think the show has demonstrated just who messed up Dory is over Keith’s death. Her panic attacks and hallucinations aren’t exactly signs of excitement. And if she does seem a little too optimistic or cheerful at the end (though I don’t really think so), it’s more likely that she’s glad to be working in tandem with her friends again. Dory observed in episode three that she had less after finding Chantal than she did before searching for the “endangered adult.” Despite her friends’ protestations, most of their group activities have centered on Chantal and the murder, so she might actually be right. It’s a sick pleasure she’s taking in momentarily thinking they’re all still in this together, but she has very little else to hang onto right now. Shawkat still manages to garner some sympathy even as Dory practically guarantees their mutual destruction. More important, she’s losing her grip on reality, and making her way into the hall of unnerved, Hitchcock heroines. Dory is a bit more Doris Day than Grace Kelly, but the signature cracking under pressure remains in place. But this just complicates matters after we see Elliott running through the streets in his underwear in search of 2-6 bags of “fresh—it must be fresh!”—ice. Her quest might have started out harmlessly enough, but we can’t ignore the real damage she’s caused. This episode title feels like a misnomer at first, because “Obsession” is what occurred last season. We watched Dory quit her job, go through garbage (human and otherwise), and sorta steal her ex-boss’ car to run up to Montreal to find a girl she had little recollection of, only to learn that her rescue might have been somewhat welcome, but definitely not needed. She was single-minded in her pursuit, because it gave her something she’d been lacking: a purpose. The search for Chantal allowed her to behave in ways she’d never have imagined before, which just made it all the more appealing and preoccupying. But the tables have turned, and now it’s Dory and her friends who are being watched—maybe even obsessed over—though not, as Portia or Elliott might hope, solely over their perfectly curated social media content. So the resurgence of the “Obsession” label is actually fitting at the just-past-the-midseason mark. It also introduces a new mystery: Who knows what they did last summer? There’ll probably be some kind of lineup soon enough—Chantal’s brother-in-law, for one, has always seemed awfully invested in her and the gang’s respective dealings—but right now, Dory is reeling from her latest loss. She’s shooed away from Elliott’s doorstep by Portia, then receives an “I need space” text after reaching out to Drew. Even her new job at Mary Ferguson’s campaign headquarters isn’t what it was cracked up to be. She doesn’t really seem to believe in the Ferguson platform any more than she believes in anything else; that, combined with her ever-present anxiety over getting caught, leaves her at a disadvantage in winning over undecided voters in the state. Dory’s so bad at the job and just so messed up that she turns to a random person for comfort, which ends poorly. And that’s before Julian tells her his big Chantal story is being published the next day. Here’s where we see this season’s balancing act in motion again. We can be both worried about and annoyed with Dory for her actions, and have those feelings justified. It’s also perfectly reasonable for viewers to reserve their concern for Elliott, who is now roaming the streets in a robe and underwear, carrying his paper-towel novel in his arms. Elliott’s decline has been precipitous, but it’s played out in a mostly realistic manner, at least as far as pushing away Marc goes. His trip to Nina’s is a cry for help that doesn’t go unheard, but it’s more than Dory can bear. “Obsession” maintains the order established in the season premiere, with Portia getting to remain in blissful ignorance the longest. But as the enormity hits Dory again, we see Drew continue to sink to really awful levels to try to secure the Shanghai job. His plan still doesn’t make much sense to me—is he hoping that Alan and Max will argue over the supposed affair, which will lead to Max withdrawing his recommendation? But it’s proof that he’s living up to his own observation about Dory possibly always having been a terrible person. Just look at what Drew’s capable of when push comes to shove. He seems conflicted, but not overly so. And now that he’s under a new threat, he’s just likely to become more desperate—and devious. Where Drew was once a clueless sad sack, he’s now wilier and more composed than all of his friends combined. That includes Portia, who may be falling for her scumbag director’s near-death experience shtick, but is the only other person in the group still capable of doing her job. Even though Search Party has demonstrated that she’s smarter than she looks or people think, Portia’s still naive enough to think there’s a way to go back to her life pre-conspiracy. Enter the director or “protector,” who talks a really good game and makes a mean spaghetti dinner. “Obsession” is the more fraught of tonight’s offerings; the noose has never felt tighter, and the group has never been more fractured. 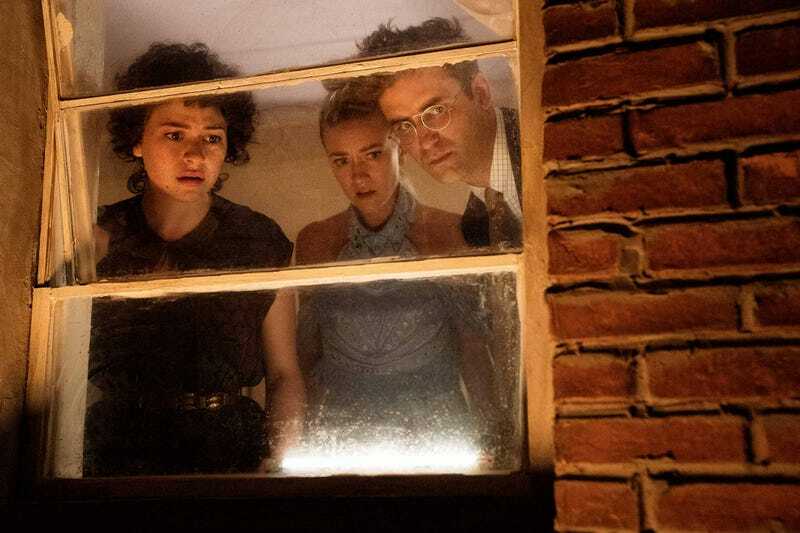 And these developments are what make Dory’s jump from the roof after a frantic climb up the stairs—which is a great homage to Vertigo, so nice work, episode director Michael Showalter—briefly believable. Her friends aren’t on much more solid ground, either; Elliott’s been hospitalized, and Portia seems to be on her way to indoctrination. Then there’s Drew, who’s not going to be able to make as smooth an exit as he hoped. The jokes are few and far between in the final stretch, but it also looks like the games are just beginning. I was actually surprised by how well Dory held it together during her acceptance speech. It wasn’t a great joke, but at least she didn’t pass out. What was a shock was seeing Julian fanboying over Mary Ferguson, even if she is campaigning for state senator. The prospective state senator’s remarks about the importance of appearing to do good perfectly fit in with the characters’ ethos. If no one else can post about it, did it really happen? The other side of that coin is, of course, Dory & co. thinking no one saw anything, just because no one’s said anything yet. That note on Drew’s desk changes everything, though. Chantal is going total Fatal Attraction before the end, right? Elliott’s pleated, high-collared coat is the garment of my dreams, and I must have it. Portia’s “bone structure and sparking personality” make her especially ill suited to prison, naturally. I’ve said it before, and I’ll say it again: Poor Marc. My favorite shifts, but that honor keeps returning to John Early, who is so fearless and funny in this role. He looks so deranged and pitiable during that “let’s weigh everything in Nina’s apartment” bit that I felt kind of guilty about laughing, but did it all the same. I’d like to think Elliott’s “Ow! My balls!” is a lil’ Idiocracy nod. “It’s all your fault.” Say it, Elliott.